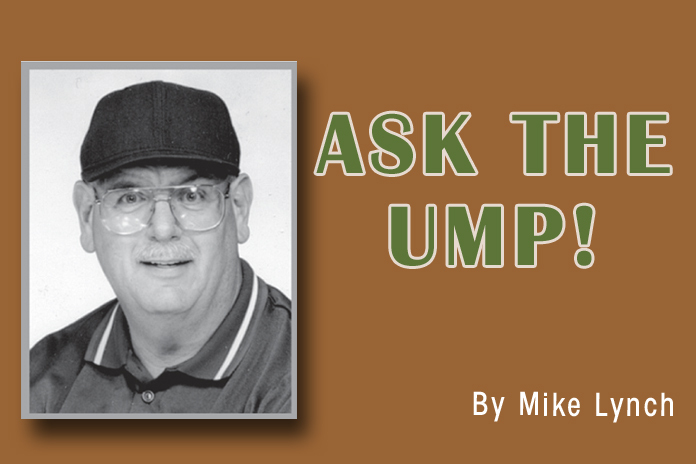 Home Sports Sports - Bayonne Ask the Ump! QUESTION: In high school baseball only, while in the set position, is the pitcher required to have his entire pivot foot in contact with the pitching plate? ANSWER: No. As long as part of his pivot foot is touching the plate and in front of and parallel to pitcher’s plate, this is legal (BB- Rule 6, Sec. 1, Art. 3). QUESTION: In high school softball only, with a runner on base, if an illegal pitch is called and batter swings and misses, is batter awarded a ball and runner awarded one base? ANSWER: Offensive coach is given an option to accept the play or penalty. Last season if coach accepted the penalty, strike call was erased, ball awarded to batter and runner advanced one base. This season, accepting the penalty results in erasing the strike, batter gains a ball in count but there is no advance of runners. The advancement of base runners was removed from the penalty (SB, FP- Rule 6, Sec. 1, Art. 1, Penalty).